With simple, classic lines and just a touch of attitude, our COMPETITION TENNIS GEAR BAG WITH SHOE POCKET is the perfect gear bag for an individual or team. Featuring a main zippered compartment, black mesh inserts on front sides, and an auxiliary left side compartment, you’ll have room for everything you need to hit the court in style and comfort. Specifically designed as a tennis gear bag, you’ll have plenty of room for clothes and gear. Athletes will appreciate the external shoe pocket, which keeps muddy or smelly sneakers away from a clean change of clothes. 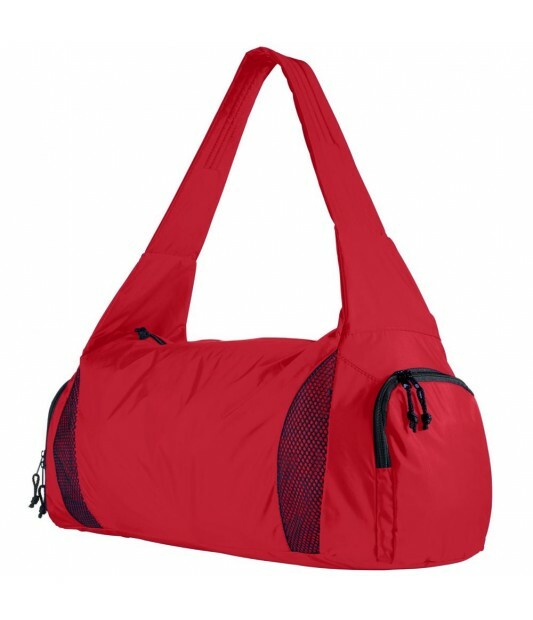 While it was specifically designed as a tennis gear bag, this bag is also a great choice for dance teams, running teams, and other athletic groups. The blank space on the front is perfect for adding a monogram or team name. From sneakers to shampoo, there’s a place for everything in this compact 600-denier polyester, PVC gear bag. What are three dimensions of this bag? Hello, The size of this bag is 21 &frac34; x 9&quot; x 10&quot; Hope i was able to help!